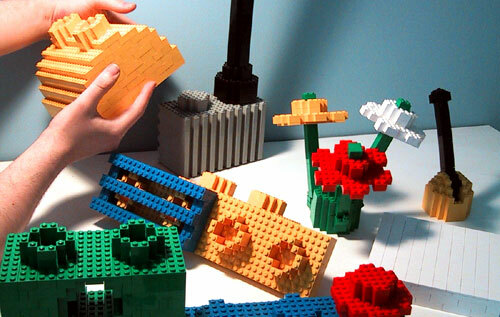 Many people have built large-scale LEGO blocks using small ones. 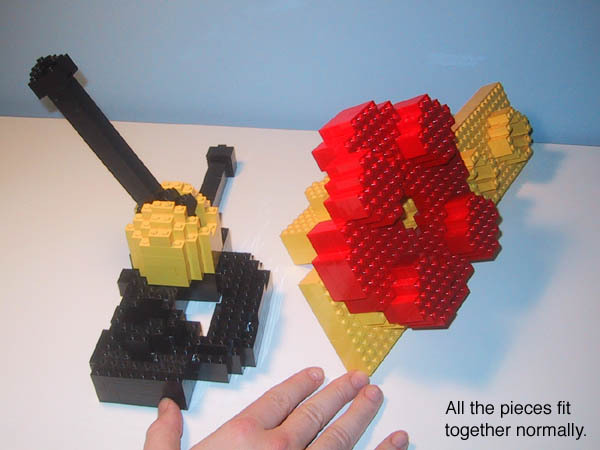 However, Sean thought it would be interesting to extend the idea by making pieces that had more visual interest, as an exploration of creating three dimensional shapes, curved surfaces, and other interesting angles that are common in LEGO pieces. Afterwards, Sean made 82 of these mega-sized LEGO blocks and assembled this 3-foot long Ferrari Formula One Race Car. 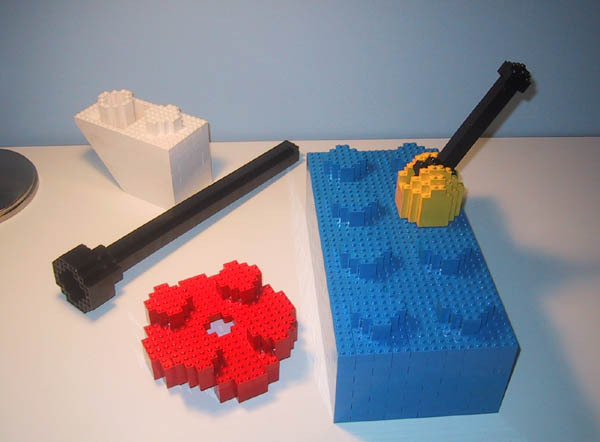 After building some simple rectangular bricks, Sean began modeling the more interesting shapes, like a walkie-talkie, a control stick, a hinge brick, a bracket, LEGO flowers, round pieces, slopes, grilles, and more. Each piece provided its own challenge. The hinge brick needed to actually hinges. The flowers' stems emerge from the base at unusual angles. The walkie talkie, which is almost life-size, is very thin and needed to be structurally sound while moving around. 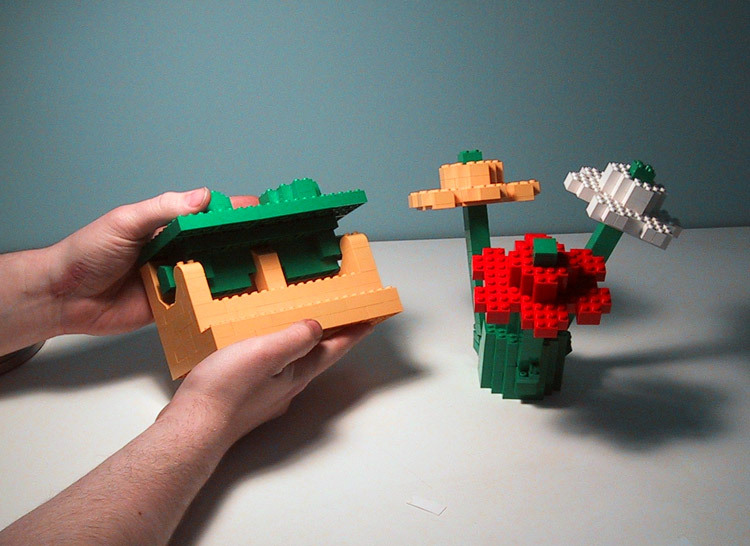 It was important to Sean that all of the pieces work together, just like the real LEGO pieces do. 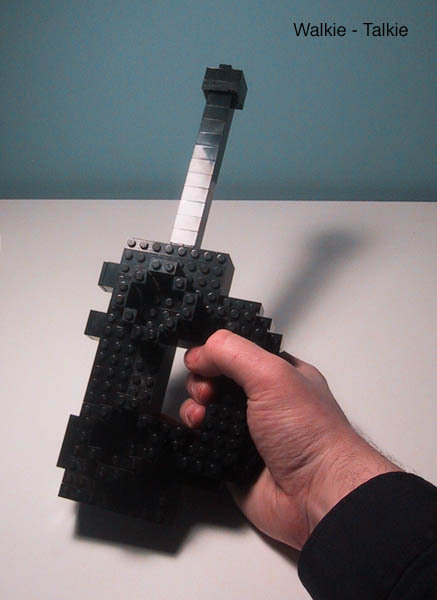 As such, the bricks were all modelled accurately, including their undersides and interiors, so that they can interconnect as standard LEGO bricks do.